The roots of a tree anchor and nourish it and help to keep the tree alive. Like a tree without roots falls easily into unhealthy and even rotten conditions, a people without the knowledge of self and kind also easily fall into unhealthy practices and rotten conditions because that which they are fed and those who have cared for them have been unconcerned with their value and the quality of their lives. While Mr. Garvey wisely advocated a return to Africa as a return to our roots, he was a forerunner of the Most Honorable Elijah Muhammad, patriarch of the Nation of Islam, who took Black people fully back to their divine roots as the aboriginal people of the planet, a people descended from God Himself. How deep are those roots and what power could such wisdom unleash? And, perhaps, more importantly where can one go to obtain this history and knowledge? It certainly resides in the Nation of Islam and in the words, way and mission of the Honorable Minister Louis Farrakhan and it is archived in Chicago at the Coalition for the Remembrance of the Honorable Elijah Muhammad. While the headquarters for the Nation of Islam can be found at Mosque Maryam, located at 7351 S. Stony Island Avenue, C.R.O.E., located at 2435 W. 71st St., is a storehouse of history and knowledge. It is a storehouse that Min. Farrakhan has applauded and supported for many years. At C.R.O.E. you can find photos, newspapers, publications and videos of the Most Honorable Elijah Muhammad speaking and walk through history. You will find information about this great Georgia-born Black man and his students—Min. Farrakhan, Muhammad Ali, Malcolm X and others—in its archives. Led by Munir Muhammad, C.R.O.E. 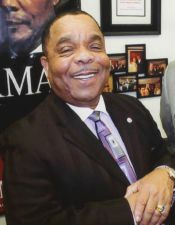 not only preserves the history and work of Elijah Muhammad, it also spreads that work through television programming that is over two decades old and through videos and programs that often streamline at www.croe.org. This important archive offers a monthly film series where you can see the Honorable Elijah Muhammad deliver his incredible Theology of Times series, see a young Muhammad Ali stand strong against induction into the U.S. armed forces and a young Minister Farrakhan defending his leader and teacher. You can also see recent interviews that the Minister has done as a guest on C.R.O.E.-TV. It is an important and fascinating place to visit, tour and hear the man who I believe is the most profound teacher and leader Black America has ever had. Don’t believe? Go to C.R.O.E. and hear the man and his witnesses for yourself. For more information call, 773-925-1600, or visit www.croe.org.